Diplomacy can get a bad rap, sometimes even characterized as all talk and no substance. But on top of that, good diplomacy is difficult to do. To be successful, diplomats are called on to be both personable yet professional, knowledgeable yet deferential, and open to compromise while still representing the interests of their home country. When official government representatives find themselves limited by the political climate, private citizens can find that they are in a better position to promote a cause than officials. Individuals who rise to this challenge are partaking in a process called Track II diplomacy. In doing so, they perform some of the same functions as government-sanctioned diplomats. As a former ambassador, Professor Akbar Ahmed takes to diplomacy like a fish to water. This summer, he went on a world-wide tour to share some of the lessons from his newest book, Journey into Europe. Throughout, he took the opportunity to promote the importance of dialogue. In the United States his tour included events at institutions such as Harvard University. In the United Kingdom, the book was launched by the Woolf Institute at Cambridge University. Chatham House hosted an event that was presided over by Baroness Pola Uddin, and Professor Ahmed called on former Archbishop of Canterbury, Dr. Rowan Williams. He then took his book to Pakistan, determined to continue this momentum. Before becoming a full time academic, Prof. Ahmed served three decades as civil servant throughout Pakistan, which earned him a reputation as a successful administrator. His reputation made it possible for him to connect with some of Pakistan’s top leaders during his visit to challenge them to actively promote Islam’s core concepts of humanity and kindness. From addressing the top Islamic jurists in the country, to visiting Azad Jammu and Kashmir where he emphasized the importance of protecting the rights of women and minorities, meeting with the Pakistani Chief of Army Staff to discuss the need to coexistence with religious minorities, and even hosting a book launch, Prof. Ahmed’s trip was a whirlwind of activity. 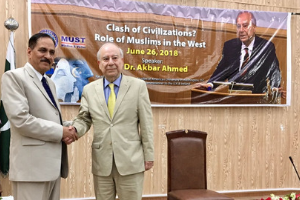 The Council of Islamic Ideology, a constitutional body that advises the legislature in Pakistan on the compatibility of laws with the tenets of Islam, hosted Prof. Ahmed on June 7th for a historic and unprecedented lecture and opening of the fast. As he addressed some of the highest-ranking Islamic scholars in the country, Prof. Ahmed urged the Council to pursue a modernist vision of Islam with proactive engagement with the West. With more than 200 guests in attendance, including prominent women’s rights activists and minority leaders, it was an extraordinary gathering of both traditionally orthodox religious scholars and more pluralist and inclusive voices. Later that month, Prof. Ahmed stepped into Azad Jammu and Kashmir, a Pakistani-administered region of the former princely kingdom of Jammu and Kashmir. Following independence from Great Britain, and the partition of British India, a series of wars between Pakistan and India has left the official status of Kashmir in dispute for more than 70 years. Travel to and from Kashmir is limited because of ongoing conflict, ultimately restricting the exchange of ideas between people. This made Prof. Ahmed’s time in the region that much more valuable. Because of this, he was keen to waste no time. In addition to meeting with President Masood Khan, Prof. Ahmed was invited by the president to give lectures at two separate universities, Azad Kashmir University in Muzaffarabad(the capital of Azad Jammu and Kashmir), and Mirpur University of Science and Technology, located in southern Azad Jammu and Kashmir. Of all the stops during Prof. Ahmed’s trip, perhaps the most important came last. On June 29, he met with Pakistan Chief of Army Staff, General Qamar Javed Bajwa, in his office at General Headquarters in Rawalpindi. Throughout Pakistan’s history to current day, the military has carried significant governing power within the country. As the Chief of Army Staff, General Bajwa ranks among the most powerful and senior government officials. “In our detailed discussions, I gave an overview of my projects and their relevance in today's world. We also spoke of the Quaid's [Muhammad Ali Jinnah] Pakistan and the importance of being inclusive of minorities in Pakistani society,” says Prof. Ahmed. “General Qamar himself has shown his commitment to the minorities of Pakistan, even having participated in Christmas activities to honor the Christian community.” He specifically suggested hosting a dinner for the bishops and Cardinal of Pakistan. While the fruits of diplomatic work are not always visible, even a small act can have wide-reaching implications. A few weeks after Prof. Ahmed departed Pakistan, General Bajwa took his advice and hosted a dinner in honor of the leading bishops and Cardinal of Pakistan.